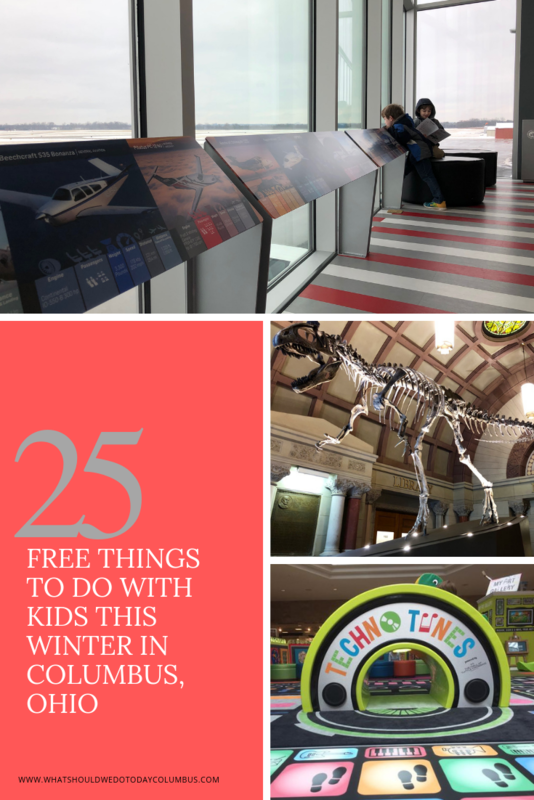 3 places i love to take my kids in columbus Archives | What Should We Do Today? 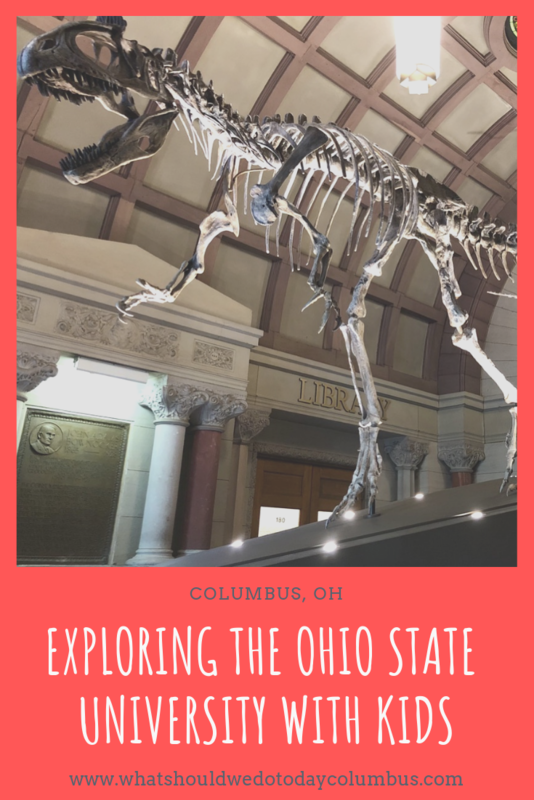 Looking for things to do at The Ohio State University with your kids? 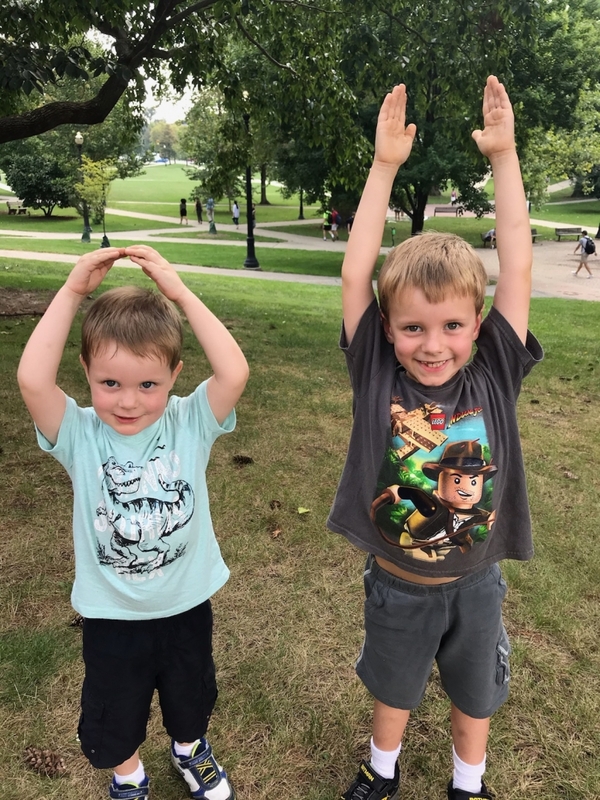 These family friendly ideas will give you a fun way to explore the OSU campus and get a small taste of what it means to be a Buckeye! 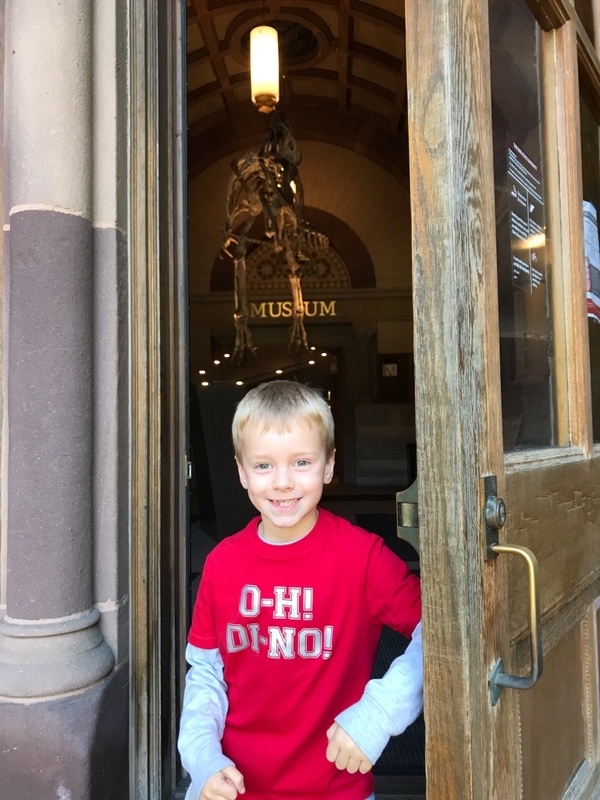 A few months ago, Erin Strouse invited me to meet her and her son at Orton Hall at OSU to see the Cryolophosaurus skeleton that was discovered by an OSU professor and installed in September, 2018! 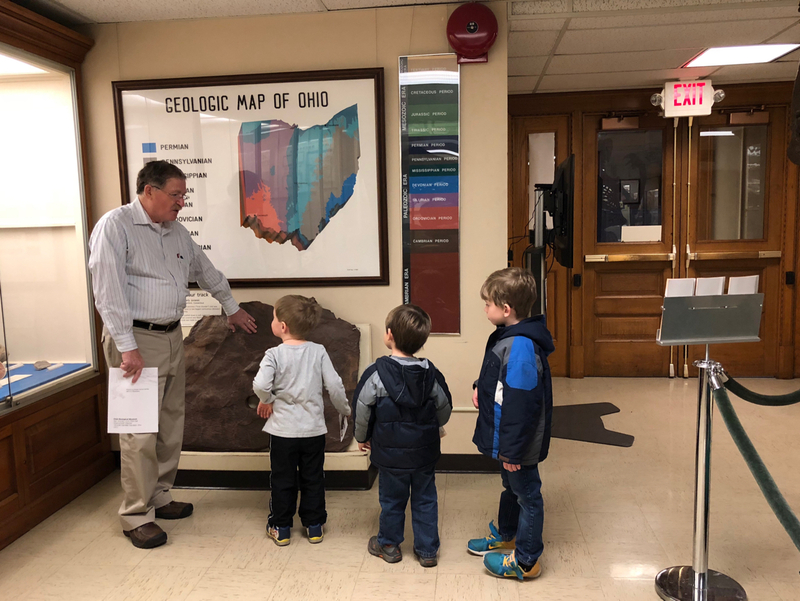 We had a fun time exploring the museum and learning about the Orton Geological Museum! 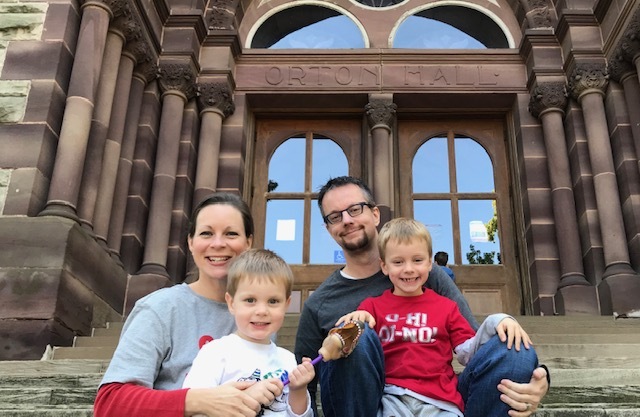 I asked Erin to share more about the museum and the other things she enjoys doing with her kids on the campus of The Ohio State University! Thanks to Erin for sharing this this fun post with us! 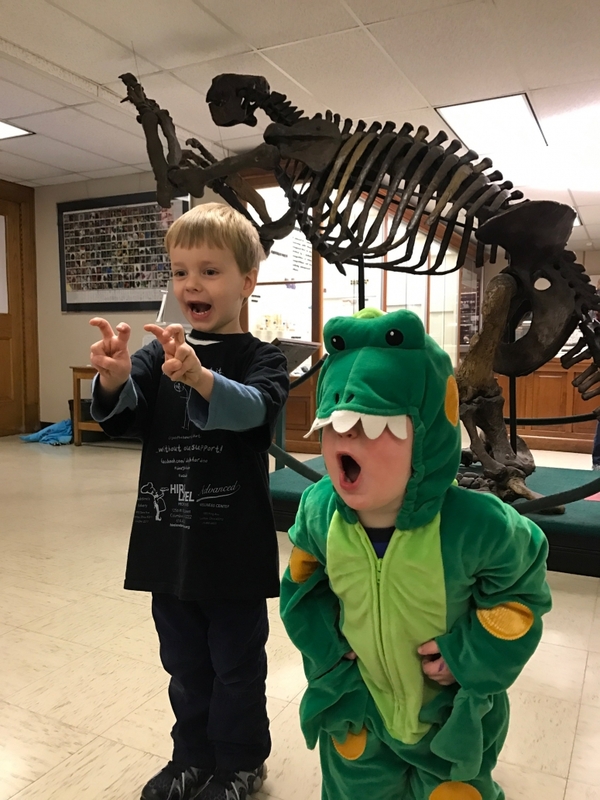 No bones about it – the Orton Geological Museum has become our favorite stomping ground at Ohio State. For my dino-lovin’ kids, the highlight of this fun and free peek into the prehistoric is a 24-foot-long Cryolophosaurus skeleton. The replica has greeted visitors with toothy grin since its September 2018 installation, just off The Oval, in the heart of campus. Transport the theropod into the 21st century with the free Orton Hall app; augmented reality pops the dino off its platform and reveals more about its significant and serendipitous discovery. In the museum (open M-F, 9-5), your kids will ooh and ahh over the giant sloth skeleton, T. rex skull, sparkling minerals, meteorites, mastodon teeth and more! You can touch a dinosaur footprint and examine the pompadour-like crest on another Cryolophosaurus skull to see why its been dubbed ELVISaurus! Your kiddos are just steps away from a rompin’ good time at OSU’s South Oval and Mirror Lake if you can snag a metered parking space behind Orton Hall. For just a few bucks, your little Buckeyes can burn off some energy in this shady greenspace before or after visiting the museum (see above). My boys love to run, climb trees, even roar about with friends in dino costumes, urging passersby to see the real deal next door. Pack a picnic lunch, listen to the Orton bell tower chime and check out its gargoyles before your lil’ dinos stomp down to the “swamp” nearby. Actually, the historic Mirror Lake is now a beautifully-renovated wetland; it re-opened in August 2018. 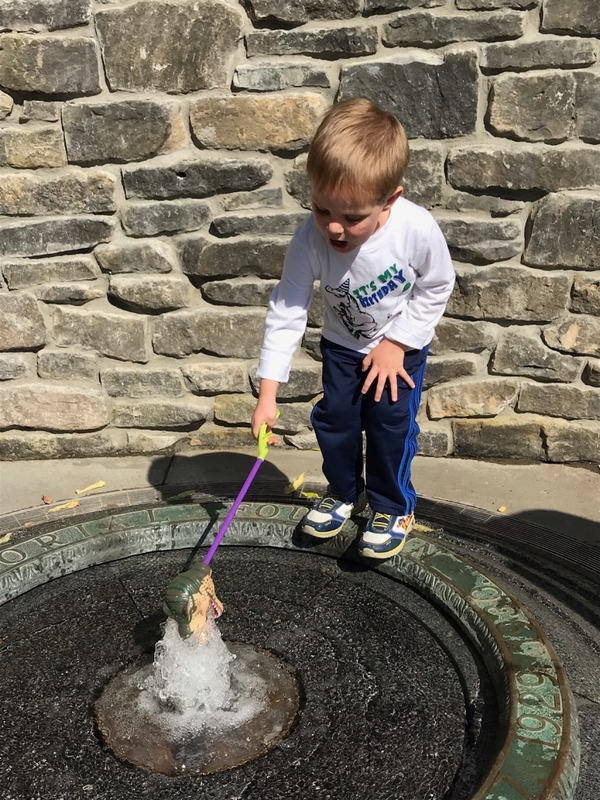 Little feet can’t resist a small, ground-level fountain; my sons’ shoes were swamped last visit so bring an extra pair and have fun exploring! My kids haven’t met a library they don’t like, but OSU’s Thompson Library on The Oval was a real treat. By the front door, students rub the head on a bust of President Thompson for good luck on exams, so my kids followed suit and recited their ABCs over the nearby alphabet floor engraving. 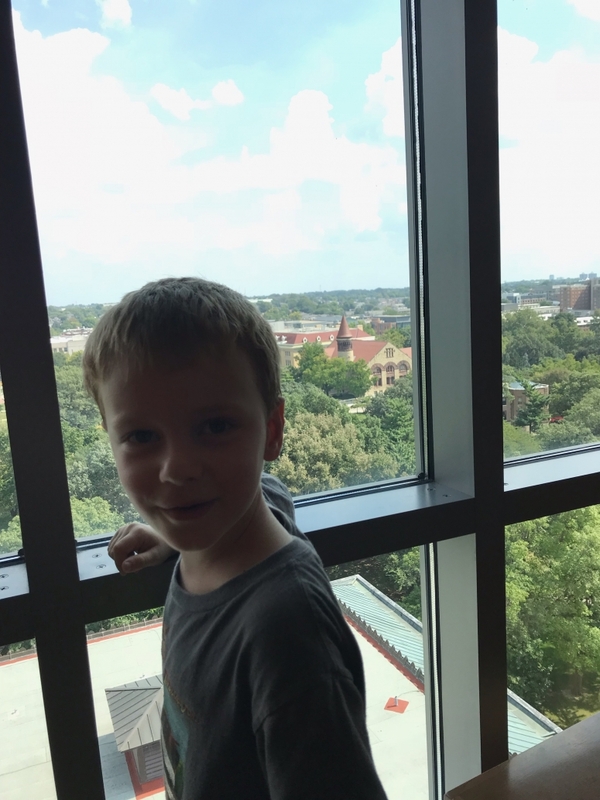 Next, we took the elevators to the 11th floor and tried our best to contain squeals of excitement – the views of landmarks like Ohio Stadium and Orton Hall (see above) are amazing! If tummies are grumbling, try the library café or nearby “Oxley’s by the Numbers,” next to a fun-for-climbing outdoor numeral “Garden of Constants” (2055 Millikin Rd.) your young counters will love! If only pizza will do, park at Tommy’s at Lane and Neil; my kids like to split a slice there and play some Pac-Man. Pack some quarters and score a #momwin! 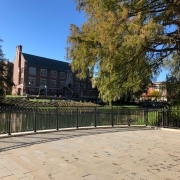 Sometimes after lunch, we walk down to the Brutus and Woody Hayes statutes on Lane, or even across the restored Olentangy River to touch the floating sphere fountain and other features of the Lane Avenue Gardens (Survivors’ Park, Chadwick Arboretum). We’ve trekked quite a bit across the university in recent years, including west campus; each spring, OSU’s Museum of Biological Diversity (1315 Kinnear Rd.) hosts a one-day, hands-on open house that’s not to be missed! 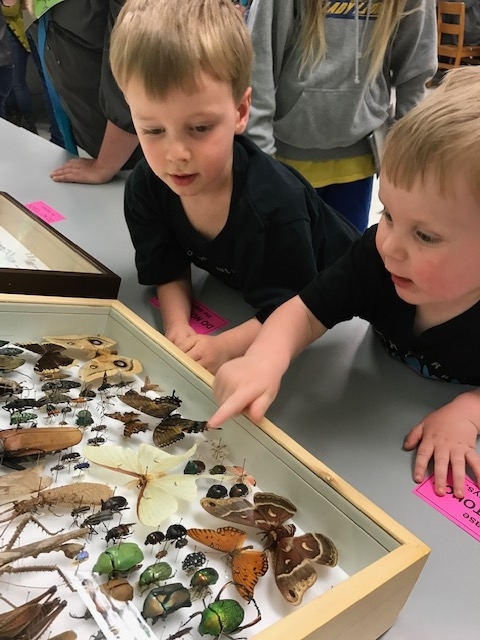 It’s free and your kids will be wowed when they get to go behind-the-scenes to interact with world-class collections of insects, animals, shells … and fossils from – where else?! – the Orton Geological Museum! This event is taking place on March 23, 2019! What other OSU must-see’s do you know of that we’ve missed? Please share! If I leave it up to the kids, they’ll just keep asking to ride the escalators up to the second floor children’s area at The Ohio State Bookstore (the Barnes & Noble at 11th and High). Ha! Maybe this year we’ll finally check out the new Script Ohio monument … Buckeye Donuts … another sporting event … the Billy Ireland Cartoon Library … the planetarium … or the Wex! What does your family like to do on campus? Erin (Tate) Strouse is a former NBC4 reporter and media relations coordinator for the Ohio Environmental Protection Agency. 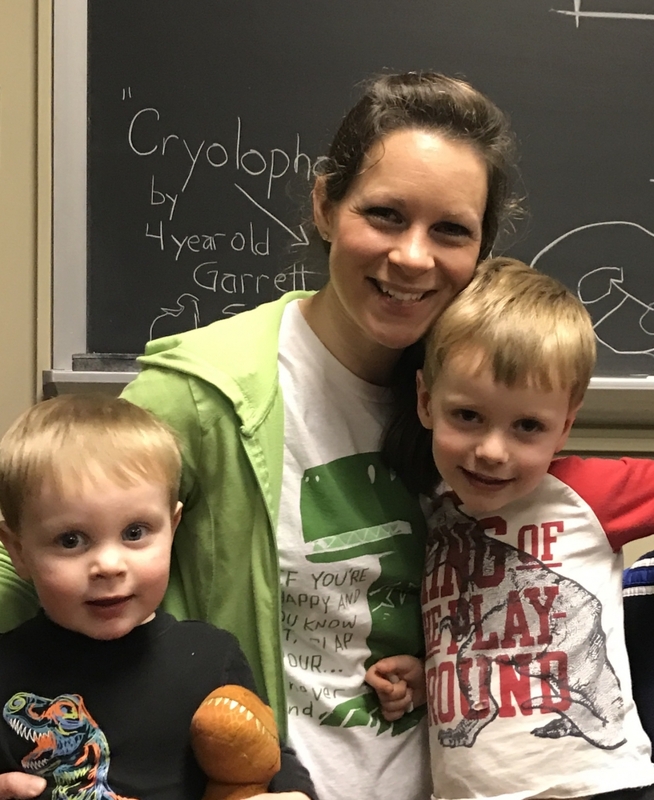 Now a stay-at-home “dino mom” to Garrett-saurus (6) and Nate-ceratops (4), she became an accidental fundraiser and ambassador for the Orton Geological Museum’s Cryolophosaurus crowdfunding campaign in early 2017. A quick first visit to the museum evolved into a kid-fueled “Dough for Dino” bake sale (and much more) to teach her preschoolers the rewarding fun of community service. Erin’s family likes to serve in other ways, too, through their church, and play in all sorts of new places across Columbus. She’s always recruiting more “Friends of the Museum,” so jump on the dinosaur train at www.facebook.com/doughfordino and Twitter @o_h_di_no #OHDINO and @erin_strouse #DoughforDinoROCKS (where she hopes to soon release her lil’ rockers’ latest endeavor) … stay tuned for another wild ride! 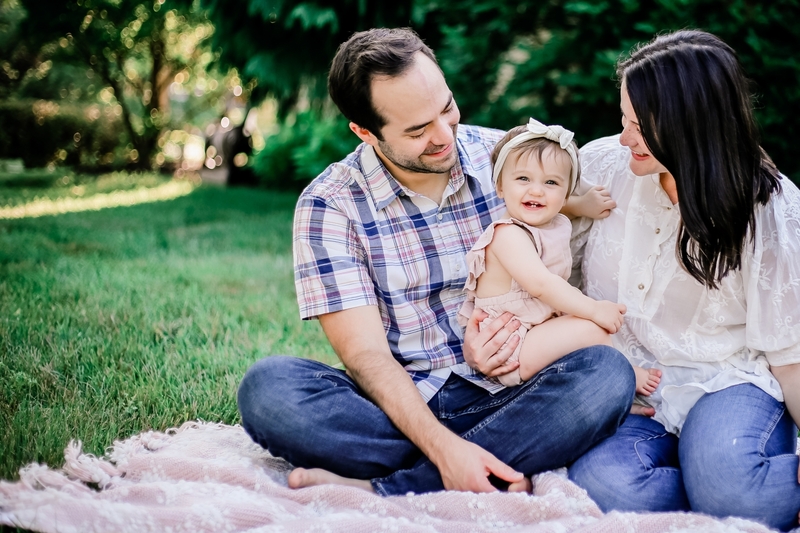 Thanks to Erin for sharing 3 of her favorites with us this month! 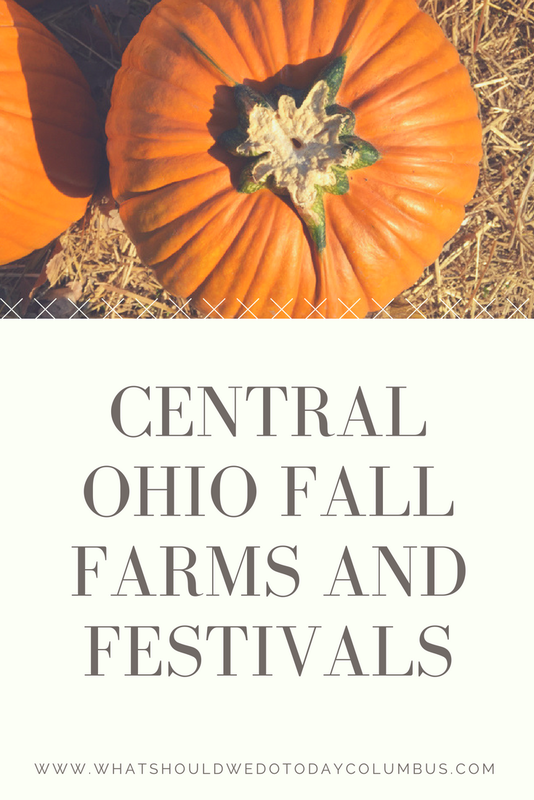 We love all the fun farms in central Ohio that open their doors to families during one of the best times of the year in the Midwest! 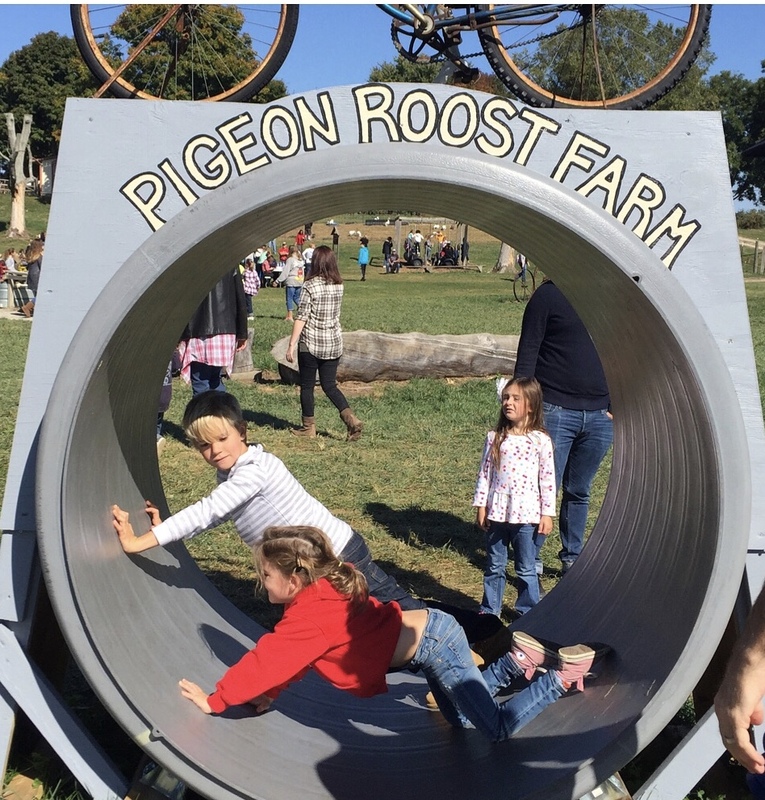 One of our favorites, Pigeon Roost is a family farm in Hebron Ohio that features a “Great Pumpkin Fun Center” each fall (Sept 15 – Oct 31). We started going when our oldest was 3 and have been back almost every year since. For a kid-friendly cultural experience, The Columbus Children’s Theater has a continual line-up of family focused performances, including sensory friendly offerings. 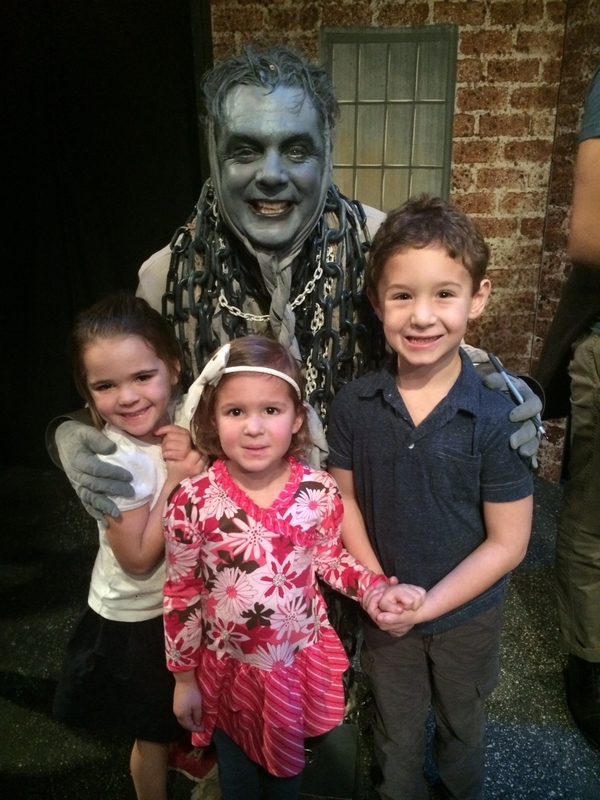 We’ve seen Mr. Scrooge there twice, once as a family and once with friends, and even got to meet some of the actors afterwards (as you can see in the picture of my daughter and friends!). 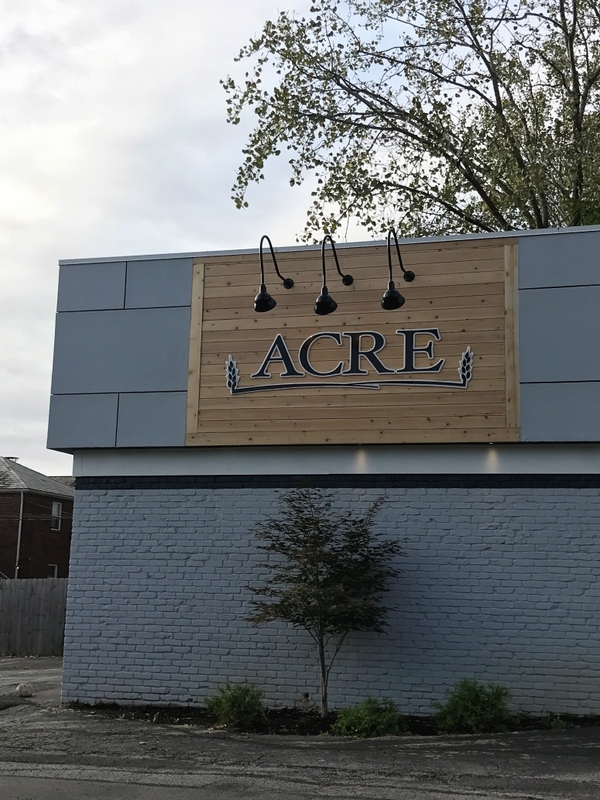 The Upper Arlington/Grandview location of Acre is a favorite lunch stop, both for convenience and for their healthy kid’s menu offerings. They have smoothies, kid sized versions of their bowls, veggie quesadillas, and grilled chicken skewers with dipping sauce and broccoli. As for me, I love their black bean hummus and their Thai bowl with tofu. If you haven’t tried the Impossible Burger, a meatless burger that’s somewhat new on the market, Acre features two different varieties of it on their menu (a classic cheeseburger or a vegan umami burger with mushrooms, miso mayo, and house kimchee). 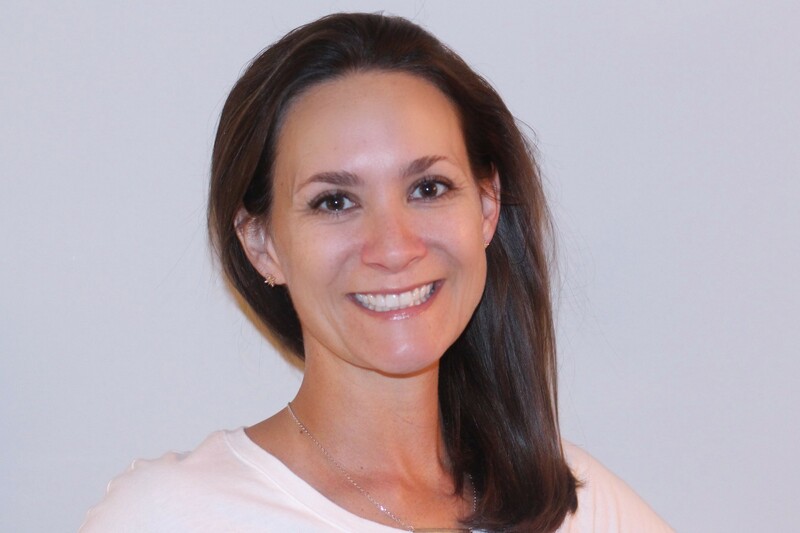 Erin Wanke spent 8 years working in clinical research before leaving to become certified as a Health Coach through the Institute of Integrative Nutrition. She now runs a health coaching business, authors a vegetarian food and wellness blog (Feed Me Greens) and provides recipe development and food photography services. She is receiving her Vegan Nutrition Certification from the Vegetarian Health Institute and specializes in helping others move towards plant-based eating. Erin lives in Columbus, OH with her husband and three young children/sous chefs/mess makers. You can find more information on her website at www.feedmegreens.com, or follow her on Instagram (@feed_me_greens)!  Looking for new ideas for places to take your kids in Columbus? 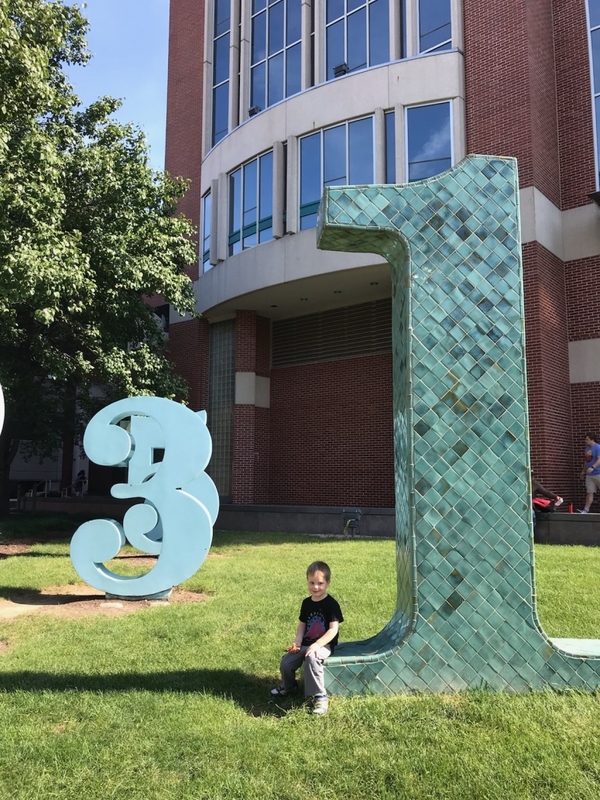 Each month I feature a local parent who will share 3 places they love to take their kids in Columbus! 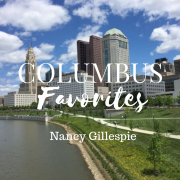 Thanks to Nancy for sharing her Columbus Favorites today! WeJoySing is an early childhood music based class! It focuses on teaching music, movement, social and cognitive skills to your child while you play and learn alongside them. We joined our first 6 week session of WeJoySing in the Spring and were so happy to be in Ms. Joy’s class, who is the Director of the program. 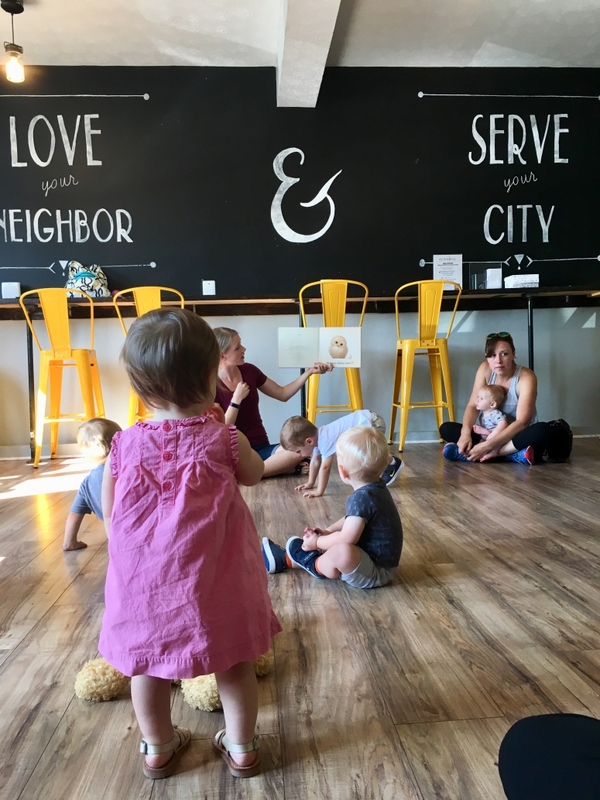 They offer a $5 drop in class throughout the summer, which is a nice way to meet other Mom’s with children the same age. We’re already looking forward to joining the Fall session which begins in September. Classes are offered throughout Columbus, with both morning and evening options. Dublin has two outdoor community pool options during summer. This summer, we have preferred the South pool mainly due to its zero depth entrance (perfect for babies + toddlers!). We also love this pool because of the shaded grassy areas surrounding it, as well as the splash pads across the street at Ballantrae Community Park. 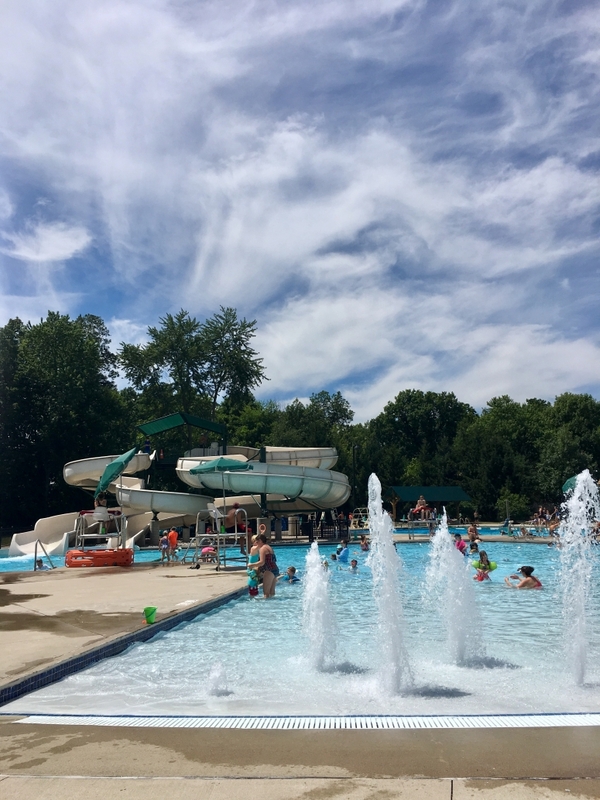 Season pool passes are available to Dublin residents and daily passes are also an option if you only plan to go a few times throughout the summer! We are lucky to be walking distance to so many great parks within Dublin. 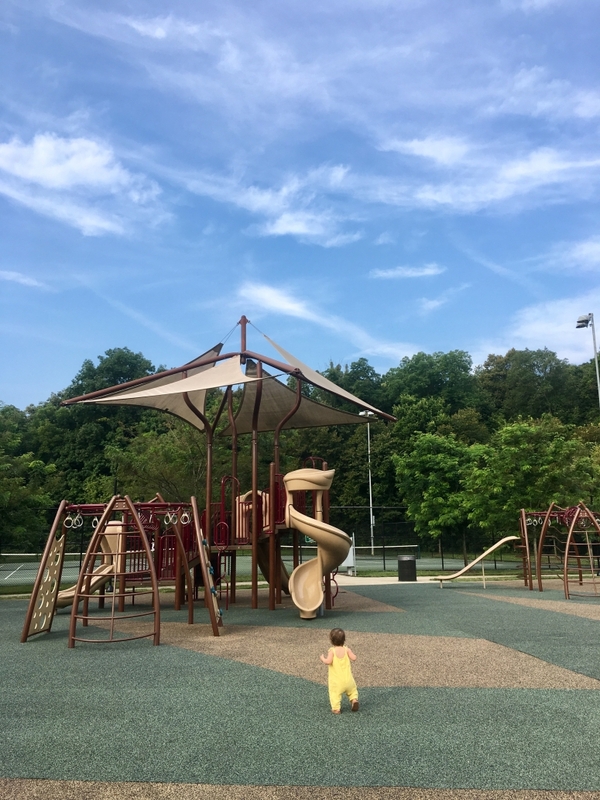 Avery Park has been our go-to park because to the big playground it offers! There is a larger playground for older kids and a smaller option for toddlers. The surface is made from rubber, so there is no need to worry about mud or mulch. We have spent many early mornings and evenings at Avery Park enjoying this free activity! Nancy Gillespie runs the website Gillespie & Co. with her husband Mike, which is a family + lifestyle blog located in Columbus, Ohio! With Nancy’s background in Buying/Merchandising in corporate retail and Mike’s experience in Video Production, they offer fresh content on everything from fashion and interior design, to their favorite local businesses and upbeat short videos. Follow along at @gillespieandco as Nancy and Mike navigate parenthood + life one sweet moment at a time.